The Dixie Coca-Cola Bottling Company is the oldest surviving building associated with the early days of "Coke," the soft drink that has been called "the holy water of the American South." From 1900 to 1901 it was the headquarters and plant of the Dixie Coca-Cola Bottling Company, parent of the Coca-Cola Bottling Company. The building represents Coca-Cola's transformation from strictly a fountain treat to primarily a bottled drink. Until the mid-1890s, Coca-Cola was sold only at soda fountains. At that time the head of Coca-Cola , Asa Candler, was not interested in bottling. Candler was approached by several individuals who wanted to bottle the soft-drink for him in different regions. Benjamin Thomas and Joseph Whitehead secured a contract with Candler for exclusive rights to bottle Coca-Cola for the Southeast, Southwest and Midwest, with Candler supplying the syrup. This contract has been heralded as one of the most valuable contracts in the annals of American business. Thomas opened their first plant in Chattanooga. It was Whitehead, with investor John Lupton, who opened the second plant in Atlanta, originally known as the Dixie Coca-Cola Bottling Company. Whitehead assumed the responsibility of marketing their bottled product and the operation expanded so quickly that they outgrew the plant on Edgewood Avenue within a year. Whitehead and Lupton began selling franchises to other bottlers, first in Atlanta where 16 franchises were established, and then nationally. The bottling plant itself is an interesting Victorian commercial building. 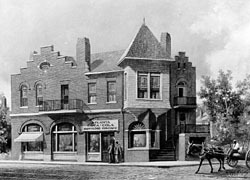 Constructed in 1891, the two-story brick building was irregularly shaped to fits its angled corner lot. It originally provided space for shops on the lower floor and living quarters above, before being adapted for a bottling plant. The eclectic features of the building include a Dutch stepped gable with oval attic window, a wooden balcony under a pedimented gable roof, Italian Renaissance-inspired arcade, round-arched windows, square turret, and a pyramidal hipped roof. During its time as the Coca-Cola bottling plant headquarters, there was an automated factory in the basement where the Coca-Cola syrup was produced, and offices on the upper floors. Today it houses the Georgia State University Baptist Student Union. The property was designated a National Historic Landmark in 1983. 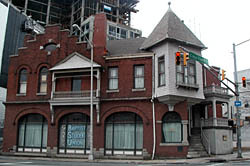 The Dixie Coca-Cola Bottling Company is located at 125 Edgewood Ave., at the corner of Edgewood Ave. and Courtland St.